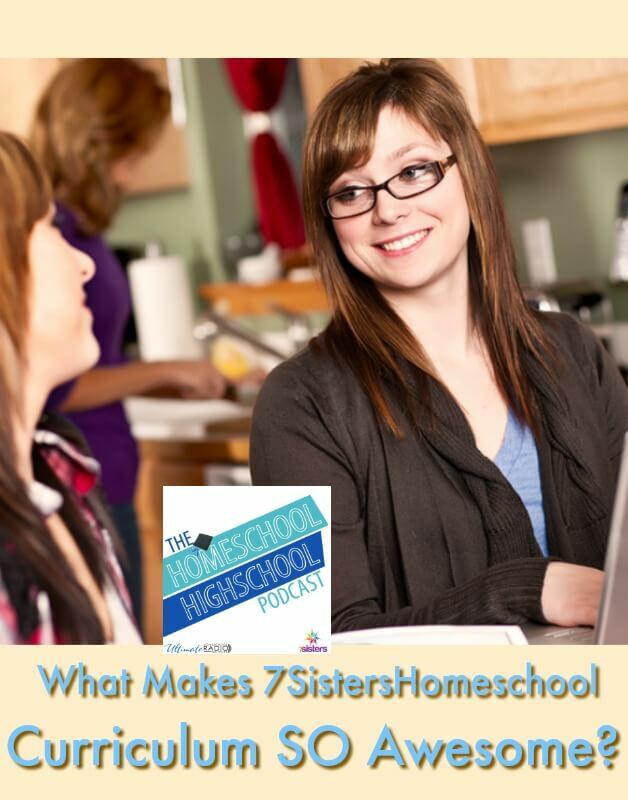 HSHSP Ep 157: What Makes 7 Sisters Homeschool Curriculum Awesome? 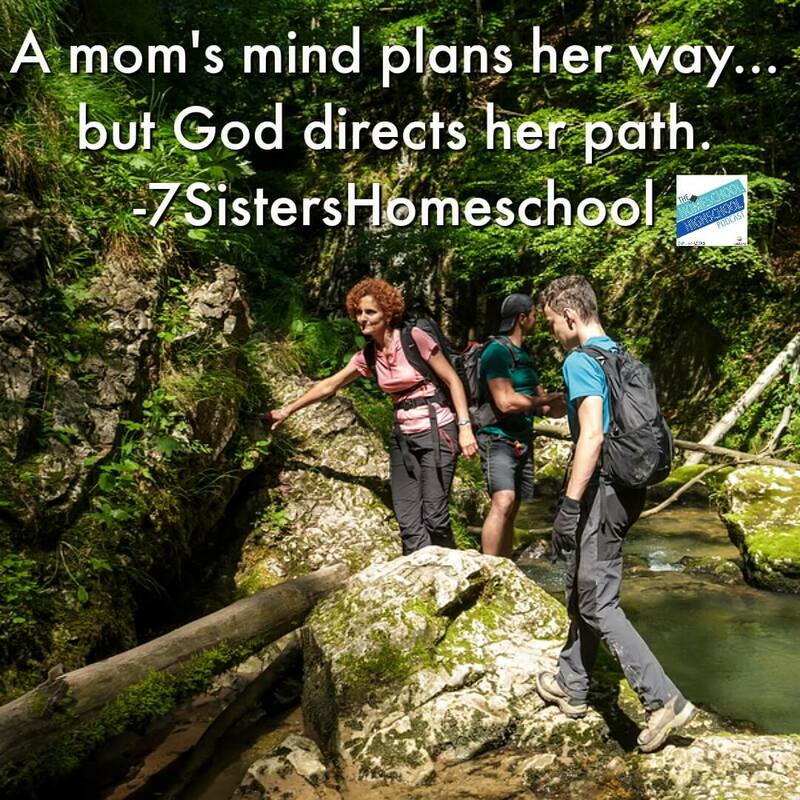 This week on HSHSP Ep 157: What Makes 7 Sisters Homeschool Curriculum Awesome? Many homeschooling years ago, Sabrina, Vicki, Kym, Marilyn, Sara and Allison were in co-op together. They worked and prayed together SO much they felt like that they were sisters! They are! Sisters in the Lord. That is, except Sabrina and Allison are biological sisters. AND Sabrina’s homeschooling graduate daughter is married to Marilyn’s homeschooling graduate son. Anyway, there are 6 Sisters, so WHO is the 7th Sister in 7SistersHomeschool? YOU ARE! Thanks for being our 7th Sister! So, after co-oping and teaching homeschool group classes for so many years we’ve felt like sisters. We’ve also developed a LOT of curriculum (there are over 200 titles in the 7SistersHomeschool.com ebookstore). All the curriculum has been vetted by our own homeschool high schoolers and/or the homeschoolers in our group classes over the years. They all really let us know what works for them and what doesn’t work. Eventually we realized that we were becoming those *older women* that Titus 2 talks about, you know: those more experienced women that mentor the next generations? So we started 7SistersHomeschool.com. We are just like you but only older! We also know that our curriculum could be blessing other homeschool families, so we make it available at the site. We believe in NO busywork texts. Have you noticed many traditional textbooks have almost the same number of pages in each chapter? This keeps things consistent but means that some chapters contain busywork to fill the pages. We believe that curriculum should be easily adaptable. 7Sisters curriculum is written at an average high school level, so most teens can work through the curriculum on their own. If they want to *level up* to a more rigorous credit, there are instructions to do that in a way that is meaningful to each teen. 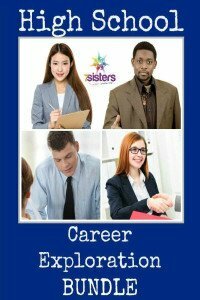 7Sisters curriculum can easily be adapted to fit circumstances and dovetail other subjects. Take a look at this post on combining credits. We believe that curriculum shouldn’t intentionally irritate the learners. So we try not to be boring, preachy or insulting. We believe that curriculum should be convenient, so we made it digital (and most of it is editable, meaning that your teens can do their work right on their computers! So all our curriculum presupposes, in a non-preachy way that our relationships with God are vital. Family is vital. Mom and dad are critical parts of a family’s homeschool. There are many stakeholders in the homeschooling process. Some are encouragers and some are not. We need to seek God above all: about homeschooling and respecting the stakeholders and how to handle them. We believe every one of our homeschool high schoolers are different. There’s not ONE right way to homeschool high school! We believe every family’s circumstances are different. In fact, circumstances can change during the homeschool year. We need God’s grace and curriculum flexibility. Join Sabrina, Vicki and Kym for a fun discussion on what makes 7Sisters curriculum awesome! Want more information on using 7Sisters’ ecurriculum? Listen to this HSHSP episode. Follow this link to our iTunes page. This will take you to iTunes and our own podcast page. Please tap *Ratings and Review* and give us some stars and a comment to help others find us more easily. 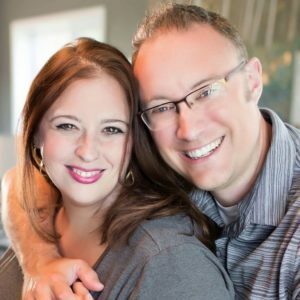 This week on HSHSP Ep 156: How to Not Be Intimidated by Homeschooling High School, Interview with Misty Bailey! 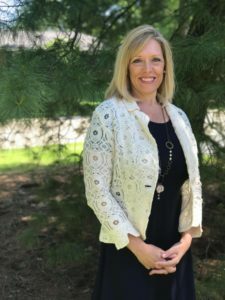 We are so excited to catch up with our friend, Misty Bailey, as we discuss ways to build confidence for homeschooling high school. Misty is a mom of 3 homeschoolers from 8th grade/high school down to elementary school. She is also the host of the popular podcast Joyfully Homeschooling and Finding Joy in the Journey blog. Misty is a pioneer homeschool high schooling mom. Most moms in her area have sent their teens to traditional school at when they start 9th grade. Misty decided to break that mold. 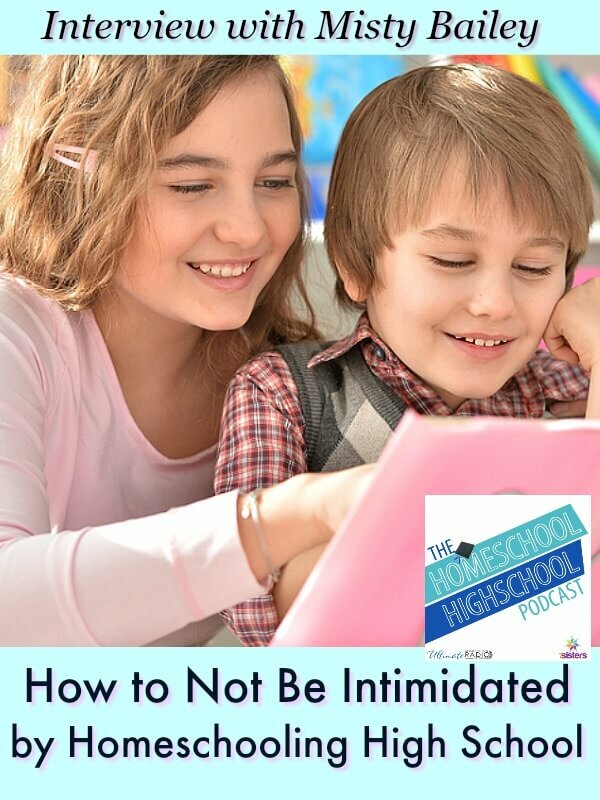 She has learned to not be intimidated by homeschooling high school! How did she do it? Misty has found lots of best friends and resources for herself and her kids through the homeschool groups and classes that she has found. For instance, Misty and her kids are Facebook friends with Latonya Moore of Joy in the Ordinary. They talk several times per week and occasionally meet in person. Check out these 2 HSHSP episodes where Latonya shares about preparing middle schoolers for high school and what it’s like for her African-American family to homeschool. Find the resources that get YOU excited about homeschooling high school. Moms need to like what they are part of and they ARE part of their teens’ homeschool high school programs. Ask about their interests. Help them identify strengths and skills. Build courses around these. Give it to Christ, ask for peace. Seek God for ways He may tweak the homeschool high school program each year. Misty has confidence in her homeschooling high school because she knows she is where God wants her and her family. She is humble enough to change things if He guides her to do so, but she loves where they are now. Listen to this interview with Misty Bailey. You’ll also enjoy this post about high school from Misty and these posts from us. This week on HSHSP Ep 155: How to do Drama Camp with Homeschool High Schoolers. Drama camp has been a beloved and important part of our homeschool high schoolers’ experience. We love drama…we know a few Drama Queens, like our Sabrina, who lead our teens on adventures of DRAMA- the good kind. Join Sabrina, Vicki and Kym for a fun discussion of Drama Camps. Who can lead a drama camp for homeschool high schoolers? You have to hold a college degree in drama…NOT! You have to have performed in major events…NOT! You can remember…Anything worth doing is worth doing poorly. You can learn to be flexible and adaptable and teach teens to be so. Sabrina remembers the year that she did drama during the school year as a class. These teens couldn’t get the script down, so they adapted: They did a Readers Theatre and it turned out great! 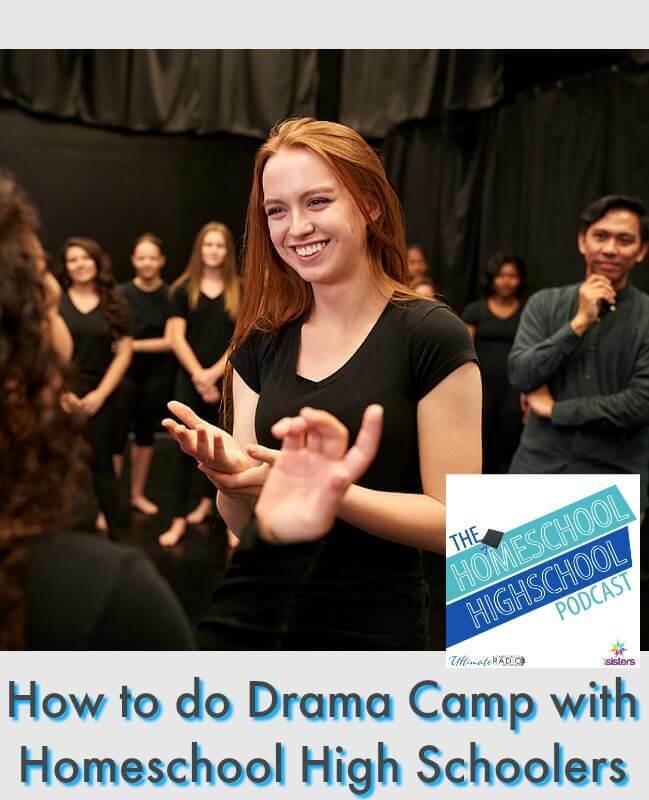 Listen to this HSHSP Episode: Drama the Good Kind for interviews with actual homeschool high schoolers at an actual drama camp. 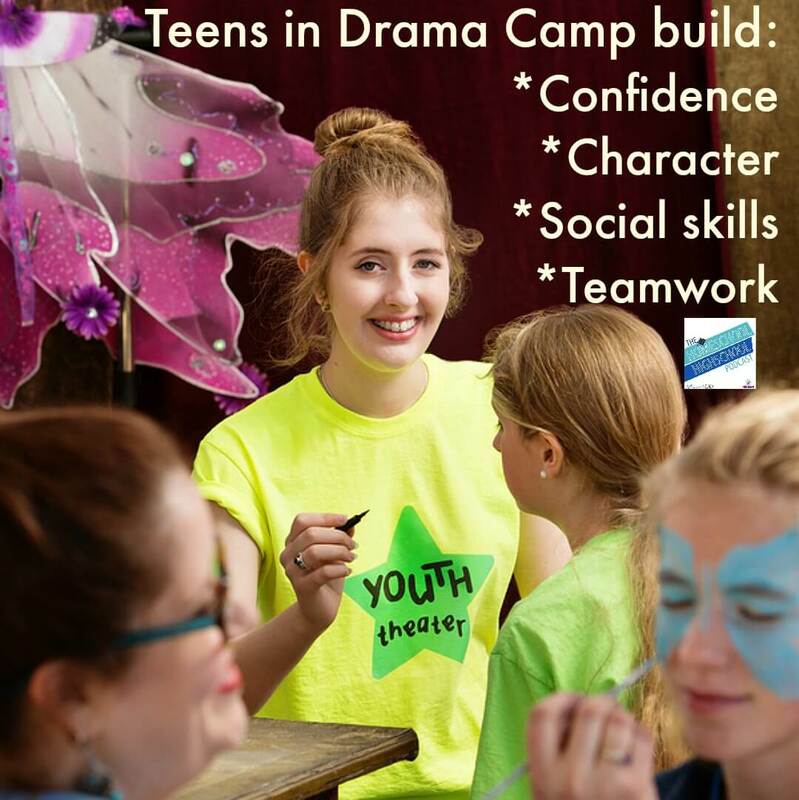 Download a copy of Sabrina’s informative guide on How to Direct Drama Camp. (it includes a video of one of her camps)! Choose a script with 1 or 2 heavy-lined characters, the rest should be lightly-lined characters. Sabrina’s scripts are tried and true. Check 7SistersHomeschool.com for A Weekend in Calcutta and Search for the Solution. Ask someone to adapt a classic fairy tale or well-known story that is in the public domain. Check out Sabrina’s Little Women. Develop a schedule. Schedule Backwards. Check Christian publishers or websites, read them out loud ahead of time. Make sure it has characters your teens can connect to and has a compelling story. Do a section of a longer script such as: Try part of The Importance of Being Ernest. What if you don’t have a stage? Don’t worry, Sabrina has rarely had one. Stages are optional! What about props and costumes? That’s up to you! You can be minimal and simple or lots of props and costumes. Writing a backstory helps build teens’ confidence and perspective-taking skills (maybe allow them to count it as one of their papers). Learning to REAPPLY. Listen to this episode about how and why Sabrina teaches teens to use deodorant! Join Sabrina, Vick and Kym for some dramatic encouragement. Also check out this post AND watch Sabrina’s drama camp production of Shelf Life. 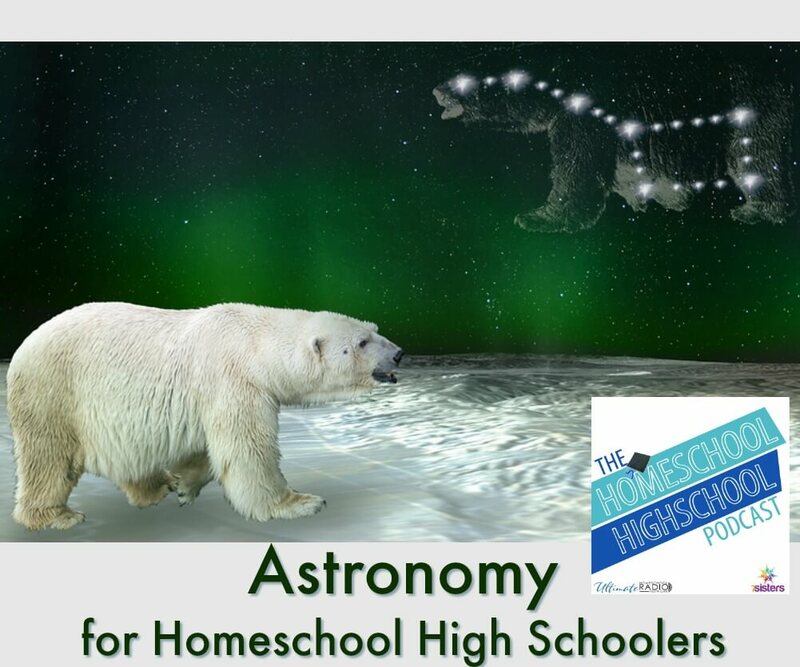 This week on HSHSP Ep 154: Astronomy for Homeschool High School, Interview with Luke Gilkerson. Homeschool high schoolers need lots of science on their transcripts. This includes Biology and Chemistry but they will also need 1 or 2 other sciences, according to their post-graduation goals. Many teens can really benefit from including Astronomy as one of those sciences. Photo of Luke and wife, Trisha, used by permission. Astronomy can be a whole-family project. It can be adapted for all ages. Astronomy is real life! All you have to do is go outside and look at the sky (although, there is so much more teens can engage so that they get a meaningful Astronomy credit for the transcript). Astronomy gives students a time to wonder at the glory of God. The feeling of awe that the night sky inspires is good for body and soul. Astronomy can be a science or an elective. Adapt it to either need on the transcript. Astronomy could also be adapted as a history credit. Astronomy is historical. In the old days, the sky was people’s calendar and clock. Their lives were guided by it, so of course it became the source of some of their legends and myths. Experience Astronomy (elementary or high school levels). High school level is 120-180 hours of work, taught by Luke recorded and online and live online, with integrated history and culture. The most important component is the *field portion* where students learn to read the sky like a map and record field notes and drawings. The course includes hands-on projects and some papers. It is a robust course for the homeschool transcript! Join Vicki and Luke Gilkerson for our discussion of Astronomy. Check out Experience Astronomy’s courses (and their Biology class that is designed as a CLEP preparation course, too). 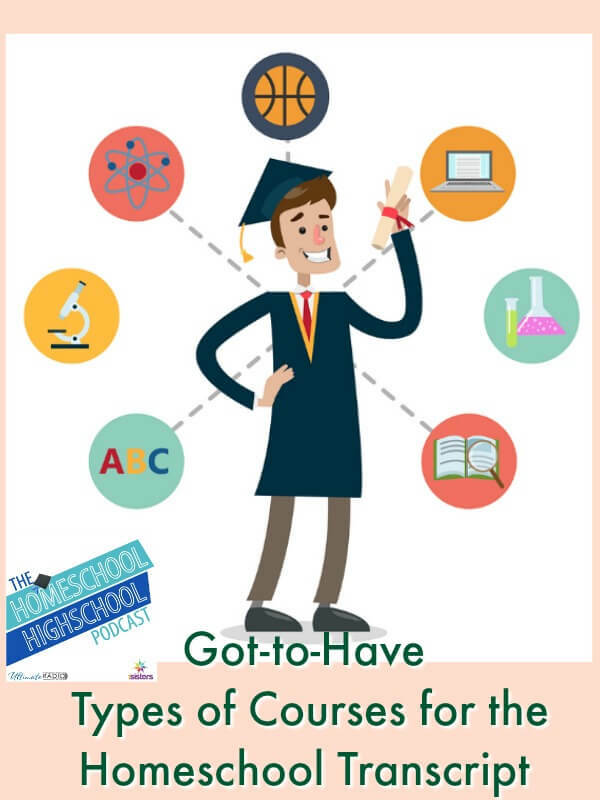 And you’ll also enjoy our Homeschool Highschool Podcast Episode on Science for Non-Science Majors. You’ll also enjoy these posts. How to Homeschool High School Science: You Can Do It! 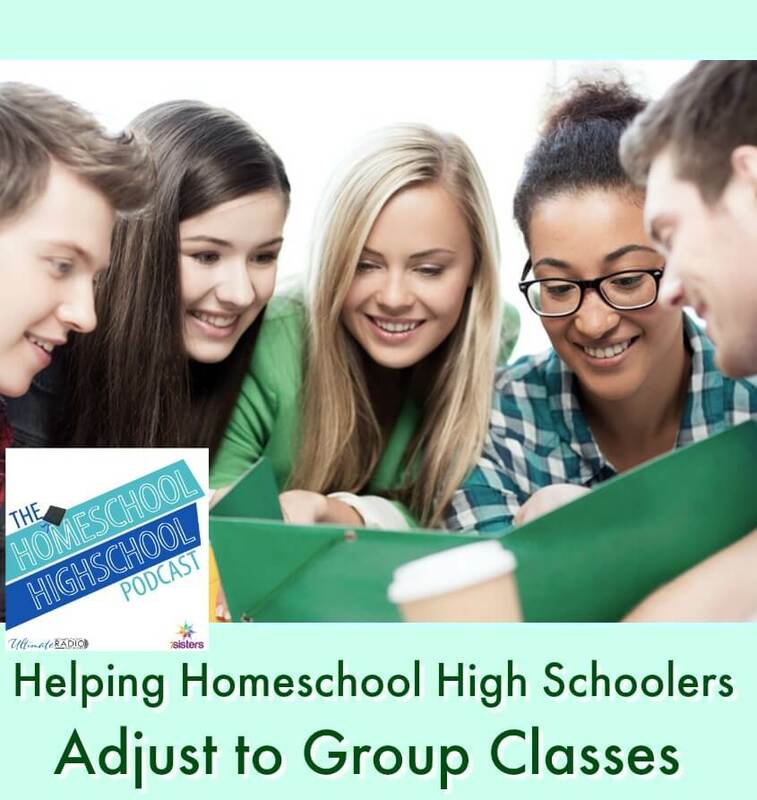 This week on HSHSP Ep 153: Helping Homeschool High Schoolers Adjust to Group Classes! Sabrina, Vicki and Kym love our homeschool co-ops and group classes. They have been an important part of all their homeschool high schoolers’ education. However, it can be a big adjustment for young folks who haven’t had the opportunity until high school. While there’s not ONE right way to homeschool high school, it’s not unusual to start joining group-learning situations at that age. Share expectations and rules openly and beforehand. (Try not to rely simply on unwritten rules, but try not to have too many rules.) You’ll love this episode to help explain our group classes’ GOOF way to handle this. Deal well with Mean Moms who don’t know the rules. You’ll like this interview with Melanie Wilson for an explanation of *relationship before rules*. Scan the room. Give yourself a minute to calmly choose a chair that looks comfortable for you. Teachers: Try poker chips. Everyone is given 3 chips at the beginning of the discussion. Students contribute a chip to the pot whenever they contribute to the discussion. This gives quieter kids the *right* to talk and talkier kids the *right* to take turns. Sabrina does better in meetings or trainings if she is taking notes (that’s why she often volunteers as secretary for meetings if 7Sister Allison isn’t there). Kym takes air notes (think air guitar for note taking). Vicki scribbles on her paper to help her focus. How do your students pay attention? If the teacher is in the middle of a lesson/lecture. DON’T interrupt. Jot questions down and ask later. If a teacher is informally chatting. Go ahead and raise your hand to ask question. Use office hours or email for challenge. Act like a college student. Make us of office hours. Sit in T zone. As Kym says: *Front Row Geeks*. Be the last student out of the classroom. Never close your notebooks while the teacher is still talking. Join Sabrina, Vicki and Kym for a delightful, information-packed discussion. You’ll also love these posts. BTW- You can listen to 7Sisters blog posts on Alexa. Here’s how. This week on HSHSP Ep 152: How to Get Your Homeschool High School Organized, Interview with Melanie Wilson. 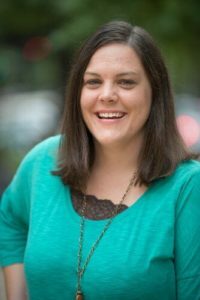 We were so excited to have this interview with Melanie Wilson of the Homeschool Sanity Podcast. Melanie is an old homeschool friend of ours so we LOVE hanging out together, whether in person at the 2:1 Conference or digitally. We’re so blessed to be able to share her wisdom about organization with all our HSHSP friends! Melanie takes seriously the task of balancing self-care, time with husband, time with family, professional life and fun. She’s noticed that what works for her, must be adapted to the skills, needs and gifts of each of her teens. How do you help teens find an organizational style? Start with a conversation. Explain how you have discovered your style and how your approach has changed over time. Emphasize the flexibility to adjust to various situations. Help the brainstorm approaches to try. Guide them through concluding whether each approach works or not. Decide on the best approach. Melanie’s book, A Year of Living Productively, takes the same process for moms: Make yourself a scientist, experiment with approaches to organization and notice what works and what doesn’t. Her book contains 80 different task approaches to try…because she knows there’s not ONE right way to get your homeschool high school organized. One of the lovely things about the book is that teens can download the forms and put them in their portfolios. Moms will love the tracking forms for themselves. For a happy, healthy homeschool life: Learn and implement the skills of boundary setting and focusing your attention on who and what is important in your life. Join Melanie Wilson, Sabrina, Vicki and Kym for lots of fun and inspirational information on getting organized. You’ll also enjoy this episode of Homeschool Highschool Podcast: Conquering Crunchtime Craziness. 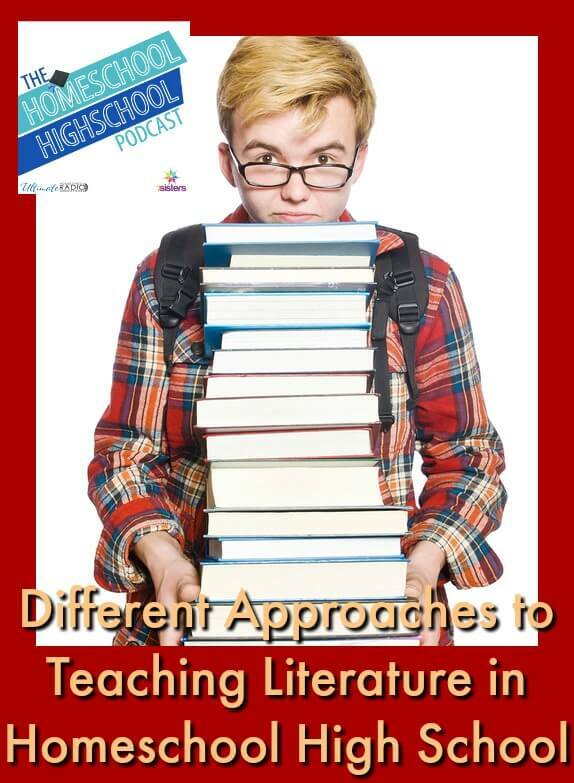 This week on HSHSP EP 151: Approaches to Teaching Literature in Homeschool High School. Is there ONE right way to homeschool high school Literature? Of course not! Sabrina and Vicki want to encourage you to have fun with right way for your homeschool high schoolers! If your teens LOVE reading, you’ll approach Literature with them in a different way from for your teens that HATE reading. Each homeschool high schooler has their own abilities and interests. Not only that, moms have their own interests and abilities (some of us LOVE reading, some don’t like to read anything more than Facebook)! Here are some approaches to teaching Literature. Hopefully one of the approaches will help you out. Covers themes and analysis skills with snippets of novels, short stories and poetry. It is a skills approach, not a literature appreciation or in-depth approach. Textbooks are sometimes a good fit for more literal learners because the reading selections are more short and the instructions are more concrete. However, teens who like to delve into a book will hate this approach (because it tends to kill the book). Teens who don’t like tons of reading comprehension questions or being told the *right way* to interpret a book, this is not a best-fit approach. Whole books approach for linear thinkers. This approach is good for literal thinkers or struggling learners. Will BORE a deep-thinking teen. Here’s an HSHSP episode on teaching literature to literal thinkers. This is an in-depth, in-depth comprehension and inferential thinking literature study guide approach. You’ll find these great for teens who like to tear a book to pieces (perhaps future English teachers). However, these HUGE literature guides kill the book for many teens. Our teens tell us that they don’t like to kill the book. They want one or two themes covered per book and mostly inferential questions. The literature study guide should be no-overkill, no-busywork. The guide should also provide suggestions for *leveling-up* if they want more rigor for their homeschool transcript or personal growth. 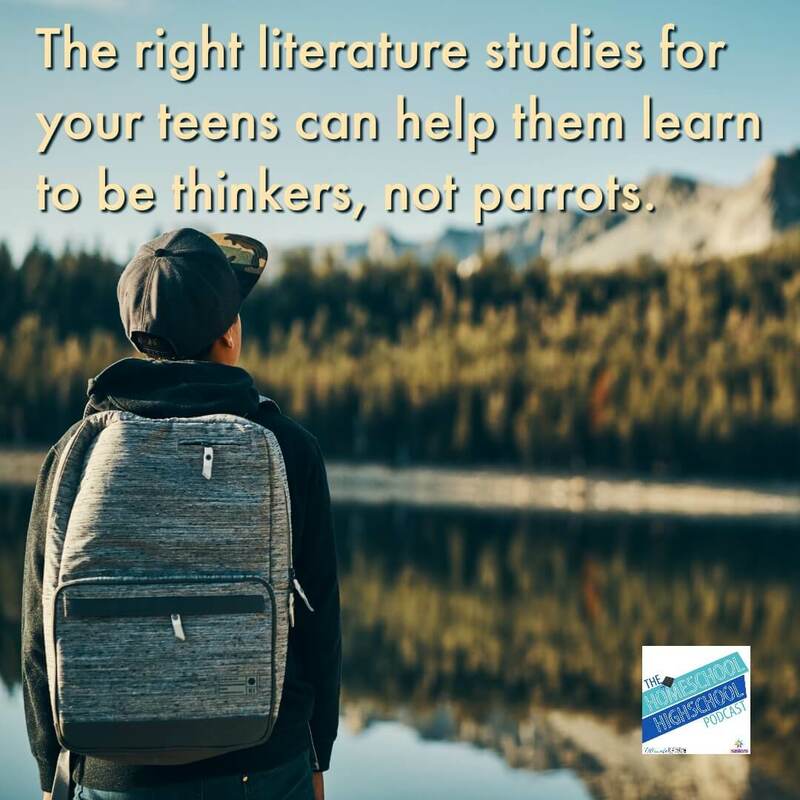 We are hoping to develop our teens’ thinking skills with these guides because we want our teens to become thinkers, not parrots! And remember: you want your teens, where it comes to literature, to inspired, not tired! Want more information on choosing the right approach to teaching literature in your homeschool? Check out this post. 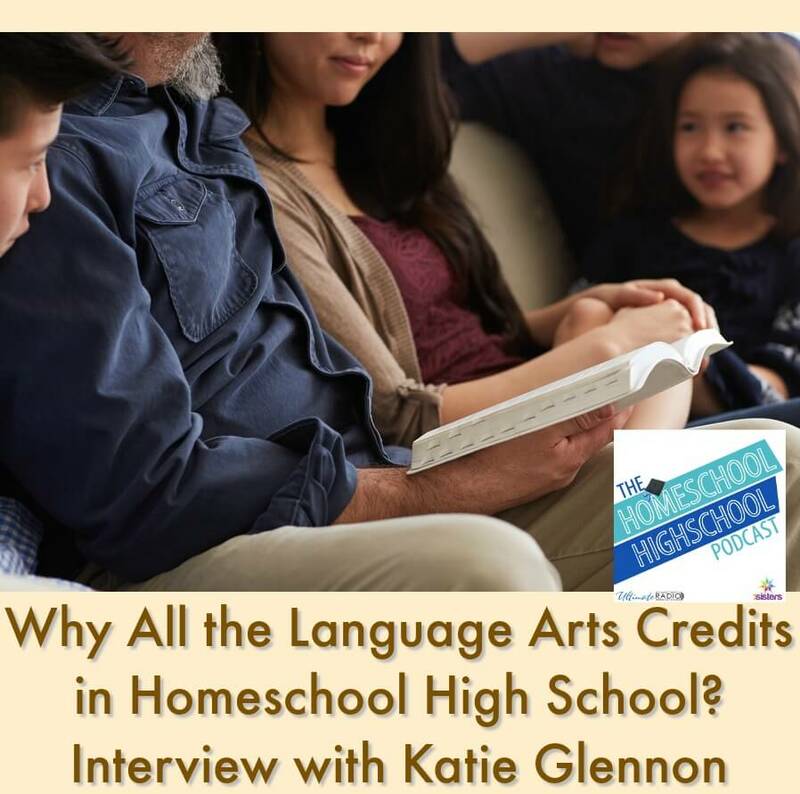 This week HSHSP Ep 150: Why All the Language Arts Credits in Homeschool? Interview with Katie Glennon. Homeschool high schoolers need 4 Language Arts credits on their transcripts. Why so many? We went to our friend, Katie Glennon, of Literary Cafe podcast and Katie’sHomeschoolCottage.com to find out. Homeschooling was important for her next son, who has dyslexia (he is now in college, btw). Giving teens reading, speaking and writing skills is important because words can plant goodness and growth in their lives! How did Katie do discussion with her wiggly son? She found that if he was being respected for his opinions and could talk while he wiggled, he did great! How did she handle reading with her son who had dyslexia? Read alouds, brain-integration therapy, allowing him choice in reading material. You’ll enjoy Katie’s podcast. Try this great episode on book reports: Essential Guide to Out of the Box Book Report Ideas and Literary Study. Visit her website with encouragement, resources, tutoring and courses: Katie’s Homeschool Cottage. And you’ll enjoy Katie’s favorite Homeschool Highschool Podcast episode: Heavy Equipment Mothering. Why is Language Arts Such a HUGE Credit? This week on HSHSP Ep 149: Got-to-Have Types of Courses for Homeschool Transcript. What kinds of courses do homeschool high schoolers need for graduation? That is one of our FAVORITE topics! Join Sabrina and Vicki for a rollicking conversation about homeschool transcripts, courses and credits. Core academics are the basic courses all transcripts need. Core academic courses include Language Arts, Maths, Social Studies, Science, and World Languages. The number of credits needed in each of these categories varies by state, supervising organization or college of interest to your teen. These types of course requirements vary widely from state to state. They also vary from family to family. Each family’s needs and interests are different. That’s the joy of homeschooling! Your teens can develop the transcript that is right for each of them. Examples of other courses would be: Fine Arts, Physical Education, Health, Social Sciences, and Drivers Education. These are courses that help your homeschool high schooler explore or develop an interest or skill. For teens who don’t have a clue what they are interested in, choose a wide variety of different kinds of courses until they land on something they love. For teens who are already invested in an interest or talent, enrich their experiences with courses in those areas. 7Sisters offers LOTS of elective choices (because we’ve had LOTS of different kinds of teens in our families and in our co-ops and group classes, so we’ve developed curriculum to meet their needs). Career Exploration courses may be the most important courses of all. It is such an anxiety-producing experience for teens to come to senior year and feel like they have no direction. Get them started with a comprehensive Career Exploration program (our popular course has been, for years, getting homeschool high schoolers on the road toward their future). Click image for full product description. Join Sabrina and Vicki for a you-can-do-it discussion of the courses your homeschool high schooler needs! Homeschool moms are busy! Bright Ideas Press gets that. 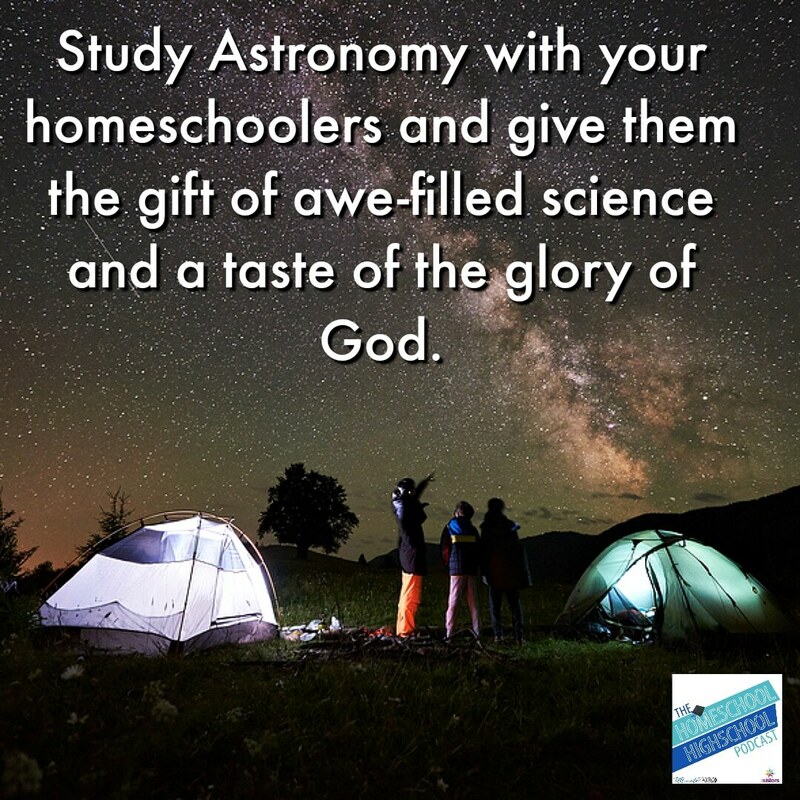 And that’s why, for over 25 years, we have promised to publish Christian-oriented homeschool curriculum that will fit your family—curriculum that is both affordable and easy-to-use with children of different ages and learning styles at the same time. Curriculum that busy Moms love! 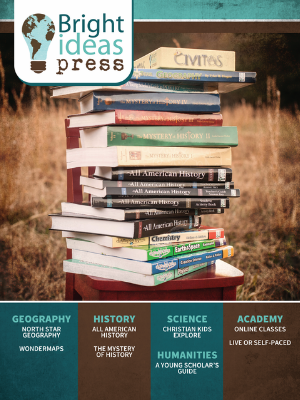 Offering history, science, geography, and humanities curriculum and over 100 options of online classes and clubs for homeschool families, the team at Bright Ideas Press creates products and resources that will not only help simplify your life, but also inspire, encourage, and equip you to educate your children. 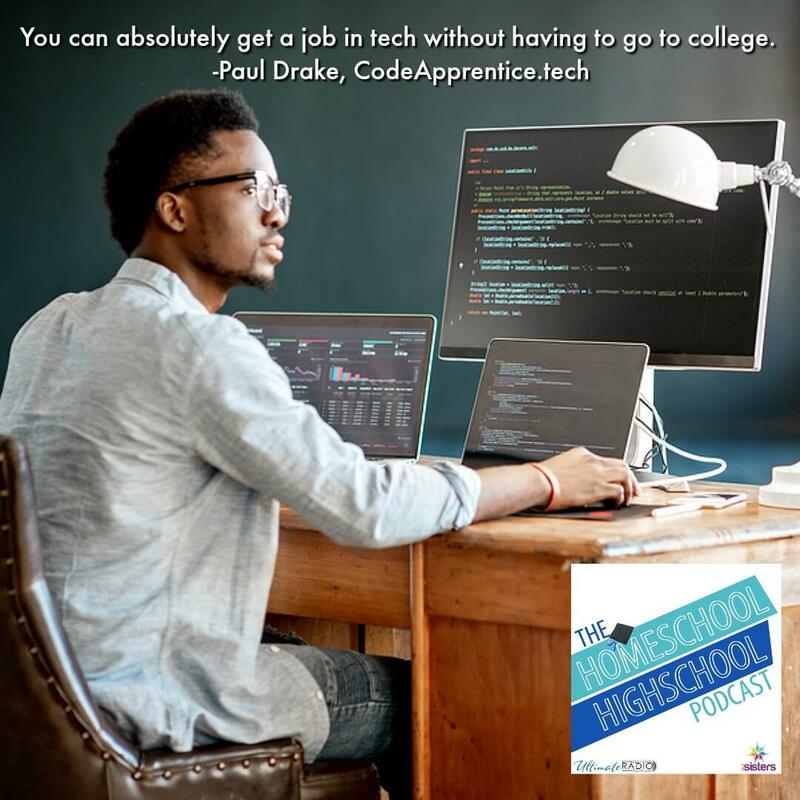 This week on HSHSP Ep 148: Coding for Homeschool High Schoolers, Interview with Paul Drake. 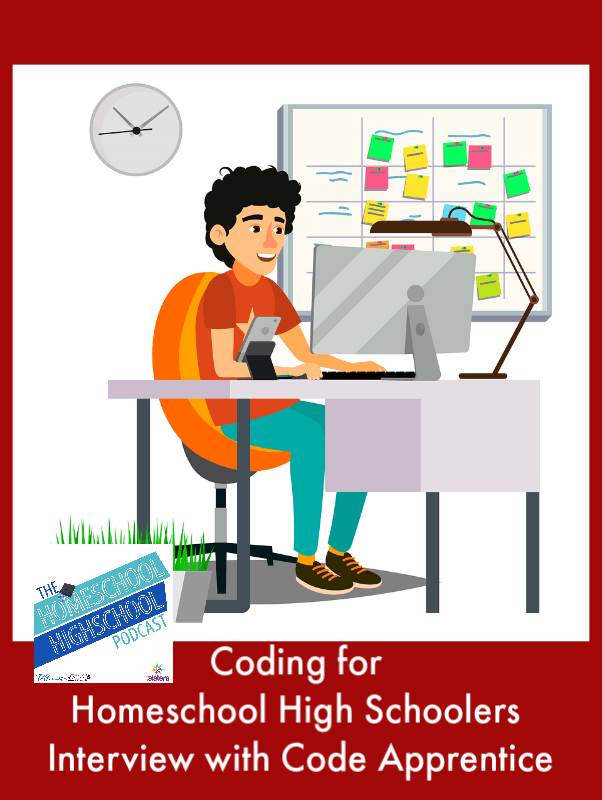 Paul Drake of Code Apprentice joins Vicki for a discussion on ways to introduce your homeschool high schoolers to coding, and to bring them to expertise level. Paul is a homeschool graduate. He homeschooled all the way through, including co-ops during high school. Paul’s mother believed that it was important to explore interests, so when he asked to explore website building. His mother hopped on it and found experiences for him. Paul got his introduction to website building from his dad. His dad introduced Paul to John at Samaritan’s Purse, who became his mentor. Paul did a lot of his own personal training, but John inspired him and opened doors for him to work at Samaritan’s Purse as soon as he graduated from homeschooling. Paul reminds us: You can absolutely get a job in tech without having to go to college and get a degree. There is greater demand for coders than there is supply. If you have built a portfolio in high school, you will be attractive to companies that need skilled coders. Paul organization, Code Apprentice, helps teens build their coding skills, create portfolios AND work one-on-one with an expert mentor. Parents get progress reports and grades so that the training can be recorded on the transcript. Perfect for homeschool high schoolers! Important goals of Code Apprentice is students obtain a *full stack coding education* and create an *end-to-end application* as they progress semester through semester during high school. Student develop a portfolio through project-based learning that makes them highly employable! Visit CodeApprentice.tech for more information. Join Vicki and Paul for an enlightening conversation.